Home Modules Module 9 Section 3 What is Physical Literacy? 3.1.1 What is Physical Literacy? The extent to which adults are physically active is based on the skills and confidence they developed in childhood. Learning fundamental movement and sport skills as a child is called Physical Literacy. 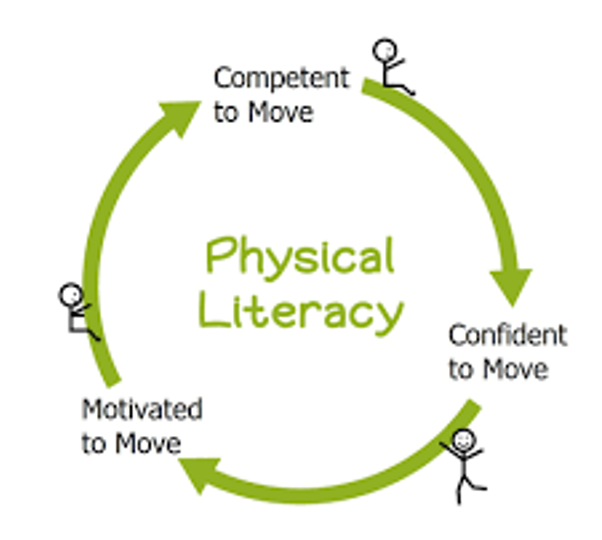 Physical literacy is the motivation, confidence, physical competence, knowledge, and understanding to value and take responsibility for engagement in physical activities for life. It involves the development of fundamental movement skills such as walking, running, catching, throwing, skating, swimming, etc. It also involves developing fundamental sport skills such as kicking a soccer ball or catching a baseball. It is important to learn these skills on the ground, in the water and in the air. The development of these skills enables children and youth to have confidence and control in movement. Source: Developing Physical Literacy Sport for Life Society and Physical Literacy for Life. A Guide For Parents Of Children Ages 0 to 12.